People often file Chapter 13 bankruptcy to save their homes from foreclosure or cars from repossession. That's because Chapter 13 involves a repayment plan rather than a liquidation of your assets as required by Chapter 7. But sometimes circumstances change that make keeping up with your payments impossible. When that happens, you can convert your Chapter 13 plan into a Chapter 7 bankruptcy if you qualify. Chapter 13 is one of two forms of bankruptcy that debtors commonly file. With a Chapter 13 bankruptcy, you don't have to give up any of your assets for liquidation. Rather, you enter into a repayment plan that lasts from three to five years. You have this time to pay some or all of your debts from your discretionary income. If any debts remain unpaid when your plan ends, the bankruptcy court discharges them and you are no longer liable for them. 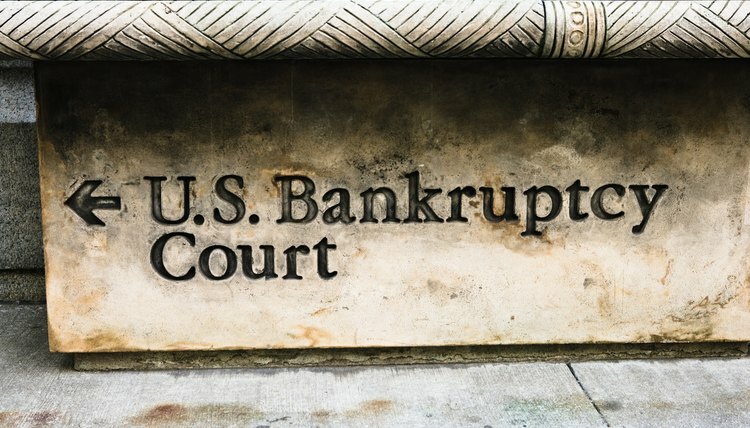 Chapter 13 bankruptcy is popular among debtors with regular incomes who want to save their homes, cars and other assets from liquidation by the bankruptcy court. Once you begin your Chapter 13 bankruptcy, you might find it difficult to keep up with the agreed-upon payments. Job loss or unforeseen financial expenses are common culprits. Or perhaps, you no longer want to keep the property you were attempting to protect by filing for Chapter 13 in the first place. After several months under a Chapter 13 repayment plan, you might decide that the plan is simply too restrictive to maintain for several years. If you no longer think Chapter 13 bankruptcy is for you, you have the option of converting it into a Chapter 7 case. It's important to note, however, that sometimes the court can order you to make the conversion. This can happen for a number of reasons, ranging from a failure to make your regular payments on time to unreasonable delays in repaying creditors that could cause them harm. Chapter 7 is known as the liquidation bankruptcy. This is because you must surrender your nonexempt assets to the bankruptcy trustee who then liquidates those assets and pays your creditors with the proceeds. Any leftover unpaid debts are discharged -- and your liability erased. The only way to protect an asset from liquidation is to find an exemption for it under state or federal law. For example, you can protect up to $24,060 of your home's value by using the federal homestead exemption. And, if you're fortunate enough to live in Florida, you can exempt the entire value of your house with Florida's exemption, which doesn't place a cap on the total amount you may protect. Unfortunately, a bankruptcy court doesn't automatically convert a Chapter 13 bankruptcy into a Chapter 7 when circumstances change. You must qualify for Chapter 7 by successfully passing a means test. Often, this is difficult to do because of strict income requirements. First, the court evaluates your income. If it is less than the median income for a household of similar size in your state, you automatically qualify for Chapter 7. If it isn't, the court will attempt to qualify you by evaluating your financial circumstances using a complicated formula. In short, the court will determine your income over a period of time and then adjust it by incorporating your expenses and permitted allowances. If the end result meets a certain threshold, you can convert your Chapter 13 into a Chapter 7, but if it doesn't, the court will dismiss your case. If your bankruptcy case is dismissed, you can refile at a later time when you qualify. Until then, your unpaid debts remain intact.